Summer dresses are lightweight, breathable, and often short dresses that keep the body cool during the hot summer months. In the 19th century, when the sight of a woman's ankle was still considered scandalous, women wore fabrics of a lighter weave and color, even if they still covered their body. Today, a few dresses are popular during the summertime. First, there's the sundress, a lightweight dress, usually made out of cotton, rayon or another lightweight fabric. 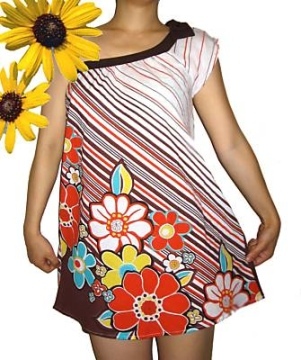 Sundresses often come in bright colors and patterns. A short hemline, and an exposed decolletage, are normal for sundresses. The shift dress provides an alternative summer dress, with a distinct vintage flair. Shift dresses make a straight line from the shoulder to just above the knee, with no waist shaping. This dress was very popular in the 1960s, so even modern versions of the dress still hint at 1960s fashion. The ever-popular babydoll dress is another alternative. However, babydoll dresses are apt to be either undergarments (and thus too revealing) or vintage dresses made out of heavy fabric. Those willing to make their own babydoll dresses out of light fabric might enjoy this dress in the summer. This sundress has one strap going around the neck. It shows off the wearer's slender figure and harmonizes with her light brown hair. This one shoulder retro dress is more like an oversized blouse. However, its rather ungainly shape is offset by a very fetching pattern, of diagonal stripes and large flowers. This is very similar to the first sundress on this page, only it has two spaghetti straps going across the shoulders. Many modern sundresses have an empire waist, with a free-floating skirt under a tight bust. Goths, punks and the "morbidly inclined" can still wear summer dresses. This bohemian dress, made out of patches of velvet and other material, is loose and breathable enough to be worn comfortably during hot summer days. Retro one shoulder dress photo by Liane Chan. Used under CC Attribution-NoDerivs license. White dress photo by Idhren. Used under CC Attribution-ShareAlike license. Bohemian dress photo by Liane Chan. Used under CC Attribution-NoDerivs license.